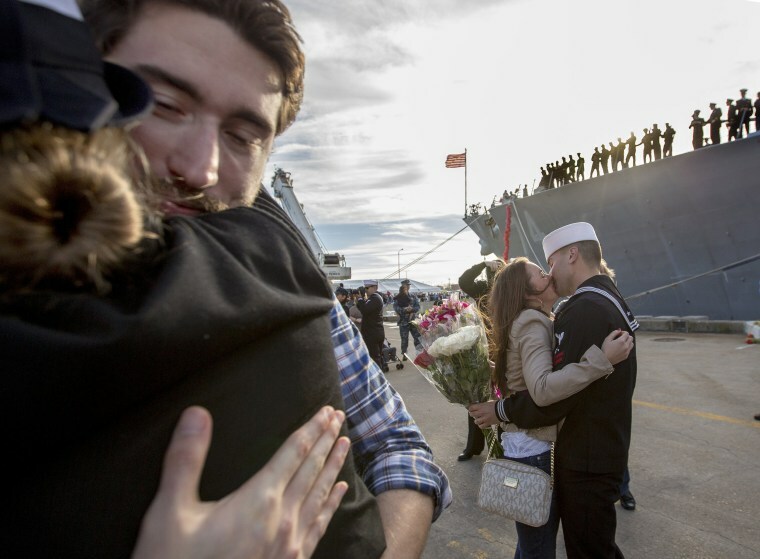 A grandmother grieves, sailors return, Santas belly up to the bar and more. 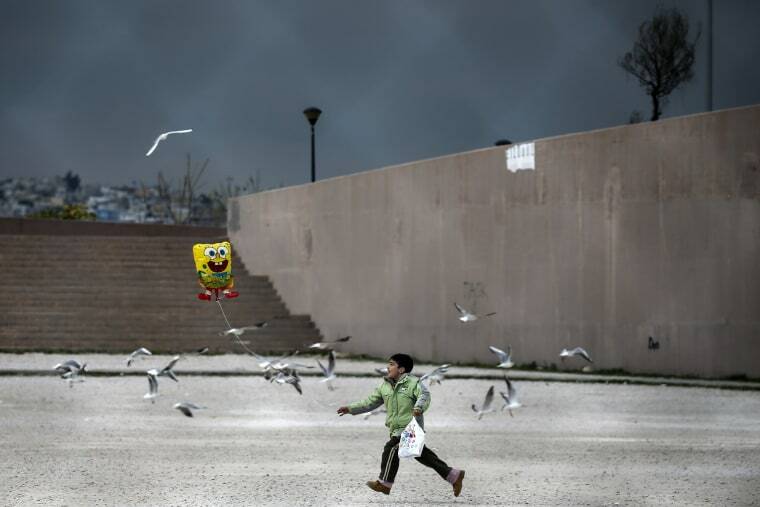 A migrant boy runs with a balloon outside the former Olympic Tae Kwon Do stadium in Faliro, Greece, a suburb of Athens, on Dec. 16, 2015. Migrants were being housed temporarily at the stadium. 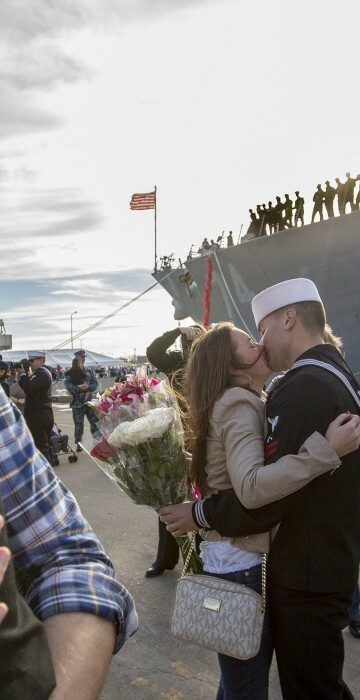 Kyle Blessing hugs his fiancee, Petty Officer 2nd Class Sophie Mulkey, left, as Petty Officer 2nd Class Dan Ravo kisses his girlfriend, Kelly Rancier, alongside the guided-missile destroyer McFaul after returning to the naval station in Norfolk, Virginia, on Dec. 14, following an eight-month deployment. 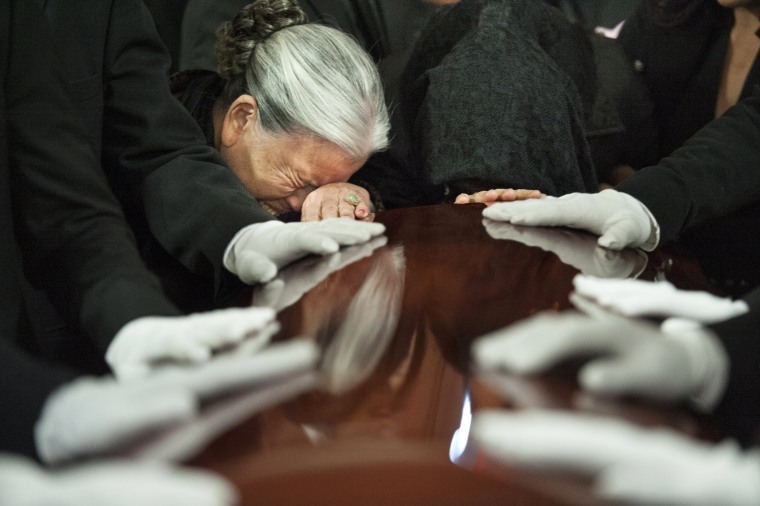 Nghi Van Nguyen, left, grandmother of Tin Nguyen, weeps over her granddaughter's coffin at her funeral on Dec. 12 in Santa Ana, California. Tin Nguyen was killed in the shootings in San Bernardino on Dec. 2. 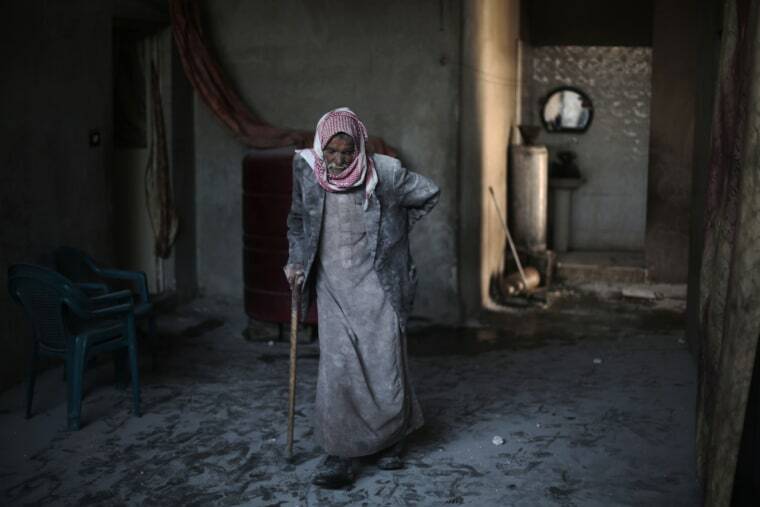 Abu Mohammed is covered in dust as he walks in his home following air strikes in al-Nashabiyah, Syria, a rebel stronghold east of the capital Damascus, on Dec. 14. United Nations aid chief Stephen O'Brien said that the "indiscriminate attacks" against civilians in Damascus and the surrounding region were "unacceptable." 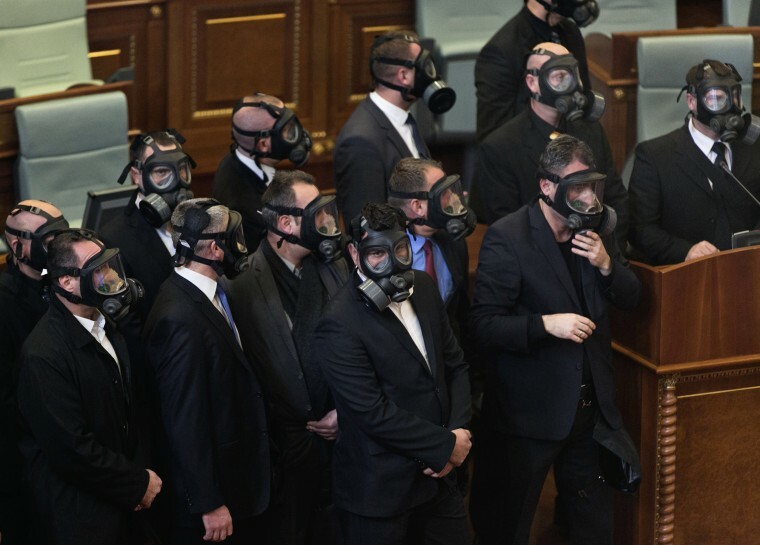 Security officers wear gas masks after Kosovo opposition lawmakers released a tear gas canister to disrupt a parliamentary session in the capital Pristina on Dec. 14. The disruption was the latest attempt to pressure the government into renouncing deals with Serbia and Montenegro. 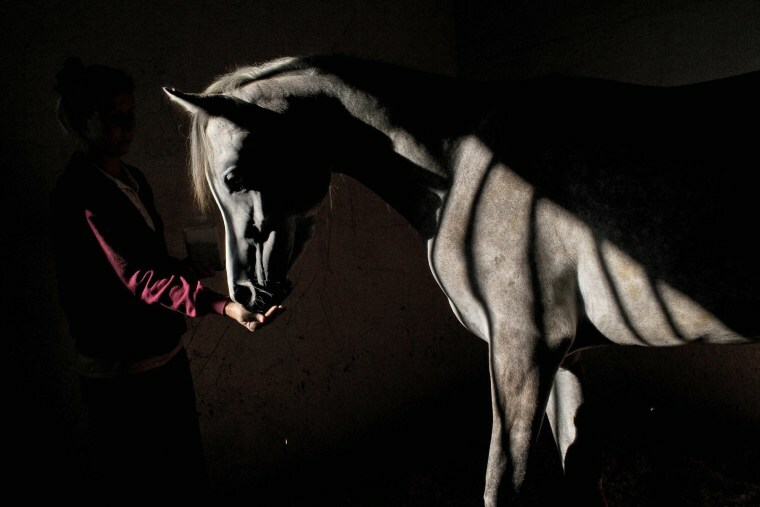 A veterinary technician feeds a horse at Hebrew University's Koret School of Veterinary Medicine in Rishon Lezion, Israel, on Dec. 7. Vets at the hospital operate on about two dozen horses a month and rely on elaborate tools and an army of volunteers to safely treat animals that can weigh more than 1,000 pounds. 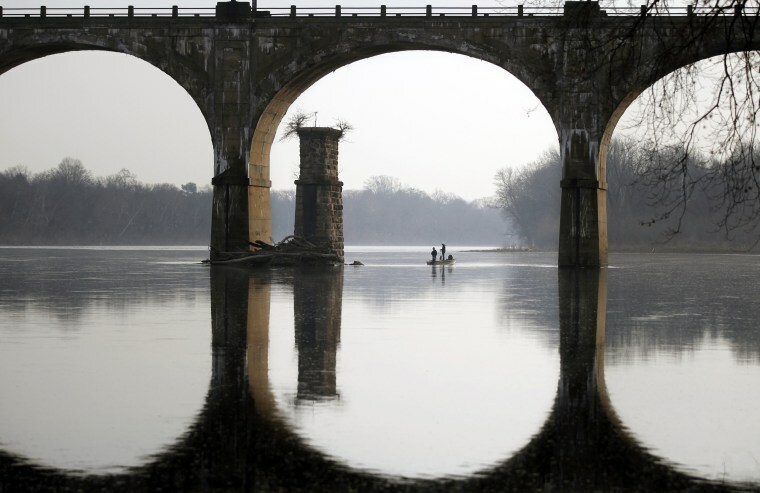 Photo made available on Dec. 14. 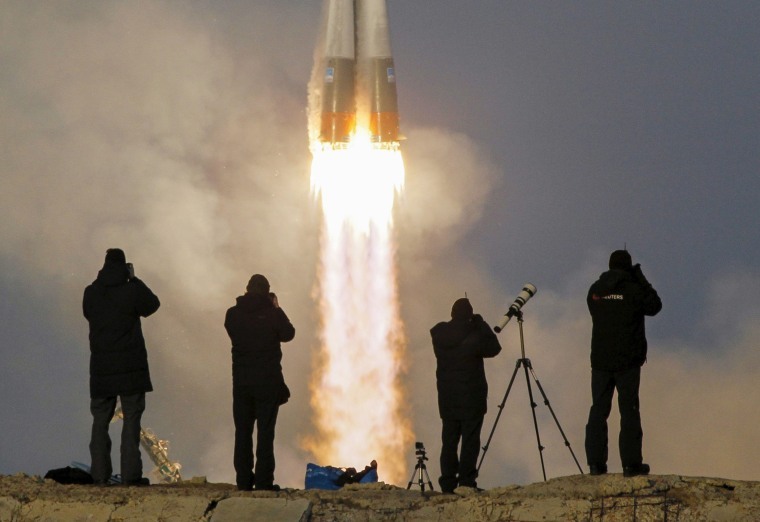 Photographers watch as the Soyuz TMA-19M spacecraft carrying the crew of Timothy Peake of Britain, Yuri Malenchenko of Russia and Timothy Kopra of the U.S. blasts off to the International Space Station (ISS) at the Baikonur cosmodrome in Kazakhstan on Dec. 15. 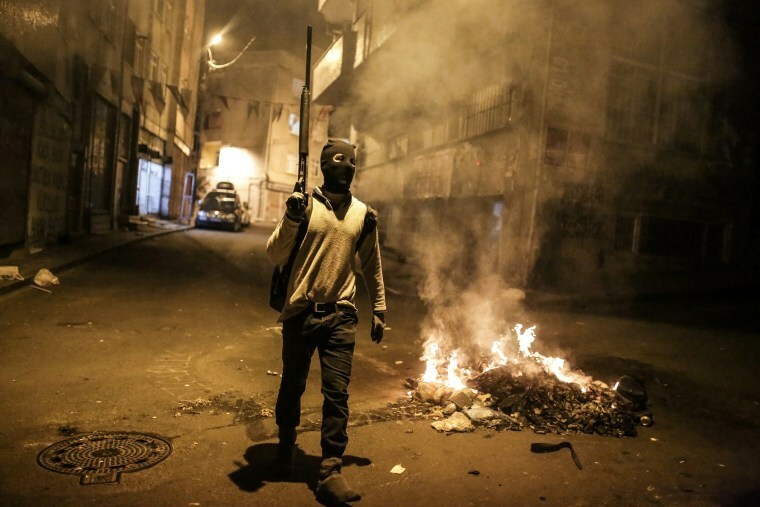 An armed Kurdish militant walks in the Okmeydani district of Istanbul during a demonstration against recent curfews imposed on Kurdish towns on Dec.15. The Turkish government has been waging a relentless offensive aimed at crippling the rebel Kurdistan Workers' Party (PKK), which has staged a string of attacks against security forces in Turkey since a two-year-old ceasefire fell apart in late July. 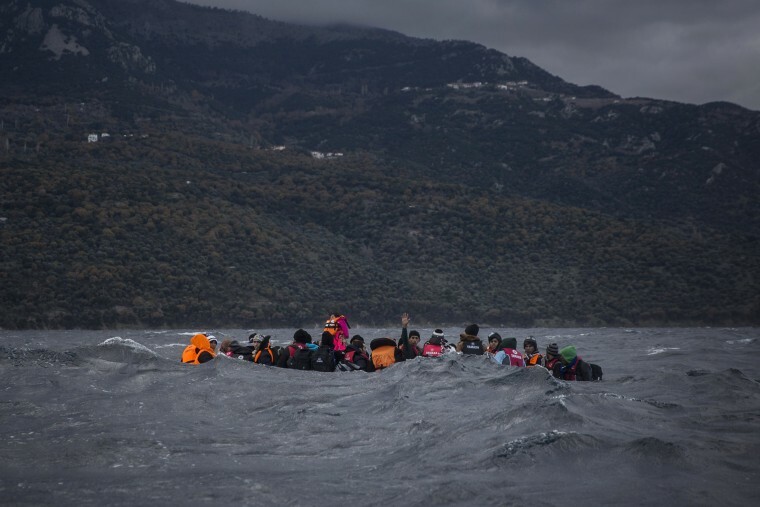 Refugees and migrants on a dinghy approach the Greek island of Lesbos on Dec. 17. According to the International Organization for Migration, more than 920,000 people have entered the EU so far this year. The influx has overwhelmed national border guards and reception capacities, notably in Greece, where some 770,000 migrants have arrived, most of them from Turkey. 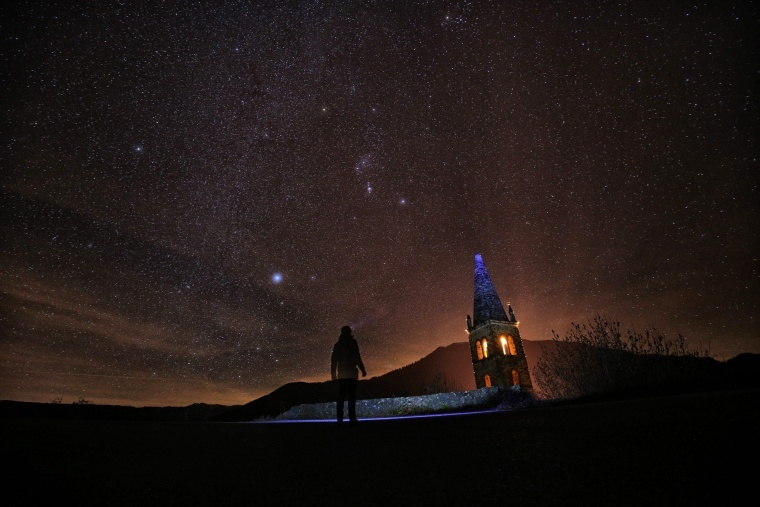 A photographer prepares to take pictures of the annual Geminid meteor shower on the Elva Hill, in Maira Valley, near Cuneo, northern Italy, on Dec. 12. 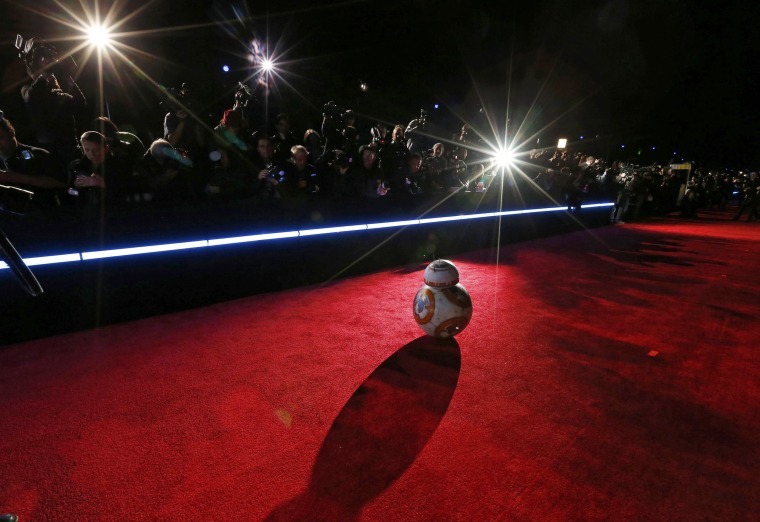 Droid BB-8 arrives at the world premiere of the film "Star Wars: The Force Awakens" in Hollywood on Dec. 14. 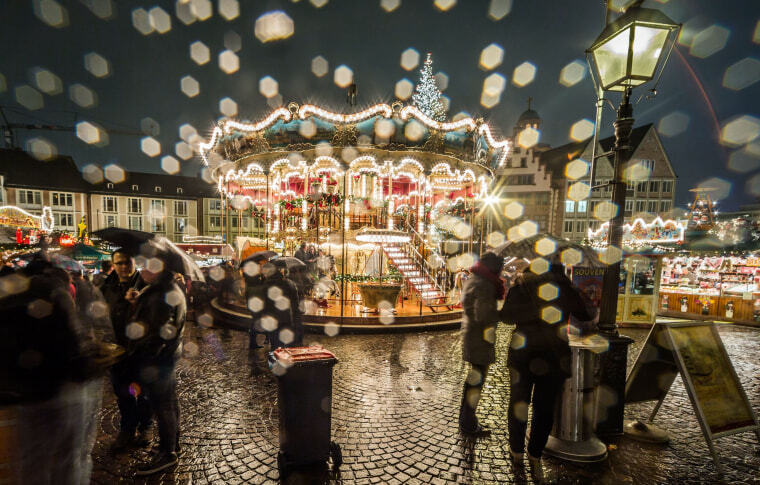 Rain falls at the Christmas market in Frankfurt, Germany, on Dec. 16. 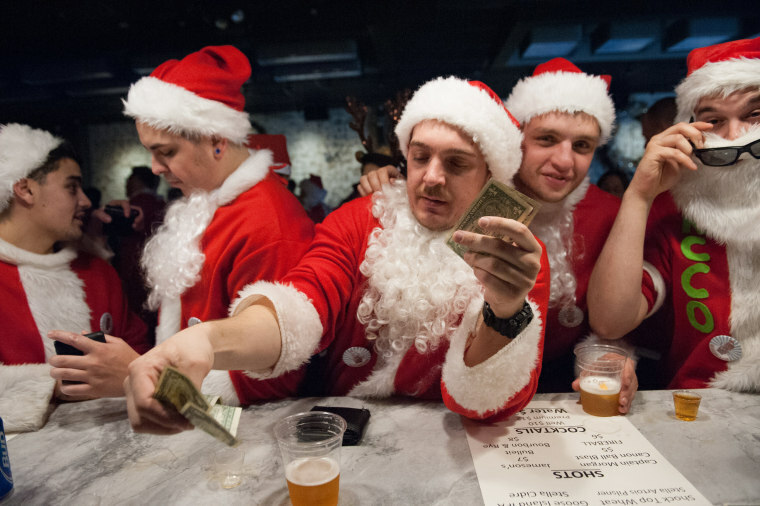 Men dressed as Santa Claus belly up to the bar during the annual SantaCon pub crawl on Dec. 12 in Brooklyn, New York. Hundreds of revelers take part in the annual holiday pub crawl, though some local bars and businesses have banned participants in an effort to avoid the typically rowdy SantaCon crowds.